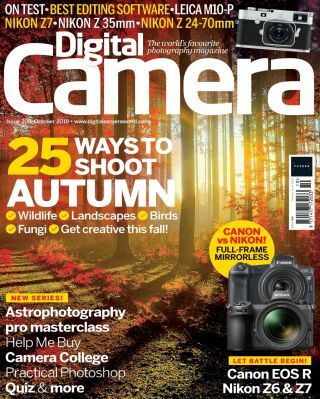 Discover the most effective ways to shoot the new season in the new issue of Digital Camera magazine, on sale now. Inside, you'll find 25 ways to shoot autumn – including tips from wildlife and nature specialists. Also in this issue: take an astrophotography masterclass with Alyn Wallace, explore the brilliant portraiture of Réhahn, and discover the benefits of full-frame cameras. In the gear section, Nikon’s exciting new full-frame mirrorless camera, the Z7, gets an exhaustive review, as well as Leica’s M10-P and Tamron’s latest 100-400mm telephoto lens. If you're interested in alternatives to Photoshop, you'll find a head-to-head of rival photo editors in the Group Test, and the mag also reveals the best sling bags and monitor calibrators for your money. The issue comes with a whopping 13 free gifts too. Every issue of Digital Camera magazine is packed with tips, techniques, pro advice, reviews, news and inspiration. To make sure of your copy every month, subscribe at our online shop from just £26 for six issues!